Two weeks ago when discussing the ongoing blow out in Libor, which today again rose to 2.3246%, up 0.38% on the day, the highest since November 2008 and higher for the 39th consecutive day, the longest streak since November 2005, we said that contrary to the generally accepted theory that "all is well", and that the move is purely technical as a result of a glut in T-Bill supply and cash repatriation, the real reason behind the Libor has to do with an overall dollar funding shortage and generally tighter financial conditions, which was also observed in the sharp move wider in bank CDS. 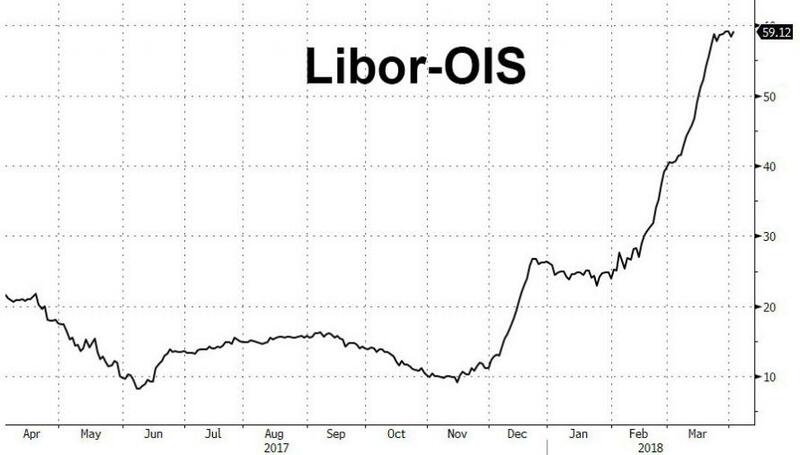 A key indication that this "less than benign" version of events is the right one, is that while the T-Bill glut is now over and there is little excess supply on the short end, Libor continues to rise. Incidentally, those wondering where it is today, after blowing out to a post-crisis wide of 60bps, the L-OIS spread just hit new post-crisis highs, just shy of 60bps. A second indication is that as we noted previously, Citi's iconic credit manager, Matt King, agreed with the "Plan B" explanation, and as we discussed, said that the sharp move in both Libor and L-OIS is the function not of technicals, but a byproduct of Fed tightening, a much more structural - and precarious - explanation for what is really going on as it suggests that the Fed is stuck and any further tightening would result in financial contagion, and a potentially disastrous dollar short squeeze. "what we are seeing is relatively modest withdrawals from the central banks suddenly have broader consequences than the central banks have been anticipating, and that therefore does constitute a greater tightening as if we had two extra Fed hikes more than they were anticipating. So far it is not systemic, yes we are not worried about banks falling over in the same way as 2008 or even 2012. At the same time, we would expect a broadening out of the stresses, or the tensions, beyond where they are at the moment. So far it's just Libor-OIS it's not cross-currency bases, and yet there are reasons to think that as the Fed drains excess reserves from the system, we will see that tension broaden out." This is a continuation of the point King made two weeks ago when the Citi credit strategist said that the level of reserves has been a direct determinant of stress in money markets – the cross-currency basis in particular, where a $200bn reduction in reserves has added about 10bp to the 5y €/$ basis, and where moves in the $/¥ basis have if anything been larger still. However, as Citi calculated over the next few months the level of excess reserves in the system is set to slide, dropping by around $300 BN over the next 3 months, which will pressure not only Libor-OIS but the various cross-ccy bases which have so far been untouched. Matt King picks up on this topic this morning, and while skipping T-Bill issuance or tax repatriation as catalysts, says that the level of Fed excess reserves is to him "the most significant long-term driver: you are draining reserves which just increased to $30BN a month, and then you will increase to $40BN a month next quarter and that exerts a steady pressure here. "So to date, the pressure yes was a shift in tax reform and how corporate treasurers are investing, but the trouble is that's not going away, that's a structural shift and we have this second structural shift from the Fed." 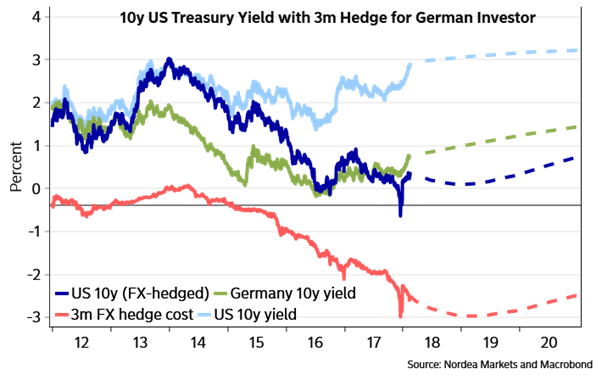 King concludes with a discussion of a topic we first touched upon in February, namely the surging debt hedging costs as a result of the blow out in Libor-OIS, and how much more expensive it has become for foreigners to purchase US Treasurys and corporate debt on a hedged basis. "80% of net buying in US credit over the last year came from foreigners and mutual funds. They've both just stopped for the last couple of months and everyone is hoping that they resume but that foreign bid - if you their Japanese investor - your hedged cost has gone from 2.50% to 2.75% and you know they will increase with each and every Fed hike and therefore suddenly US credit doesn't look attractive and we're not convinced you're going to get a rebound there which is a big global negative." Indeed, because without foreign buyers at a time when the Fed is hiking rates and when the US is set to double its Treasury issuance and sell a net $1 trillion in debt this year, it is increasingly unclear how - absent QE - the Treasury will be able to do this without blowing out interest rates. Matt King's full clip is below. 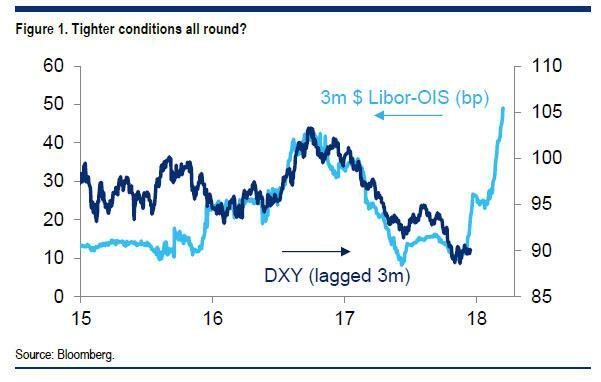 Citi: Rise in Libor-OIS spread has further to go from CNBC.